Provides definitions of child traumatic stress and Attention-Deficit Hyperactivity Disorder (ADHD) and explains how symptoms can overlap, as well as summarizes some of the differences between the two. 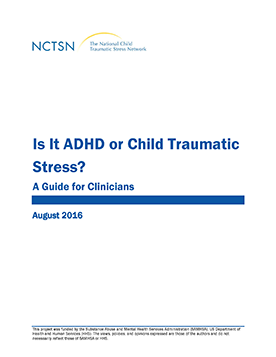 This fact sheet decribes how child traumatic stress can sometimes be mistaken for ADHD because of the overlap between ADHD symptoms and the effects of experiencing trauma. Understanding these differences can help parents and providers assess and treat children appropriately and more effectively.